Practically all movers offer storage services. 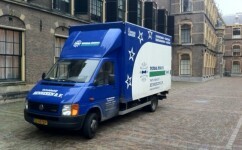 Some movers do not have storage facilities of their own and use those of colleague movers. Others do have their own storage facilities, but these may not always meet today’s requirements. Henneken International Movers has its own modern temperature controlled facility located in Zoetermeer, which is protected against fire and break-ins. Your possessions will be stored in one or more sealed storage containers that will be used only for your belongings. Therefore it’s perfectly safe. You are welcome to check out our warehouse to see for yourself how professionally we handle your belongings.